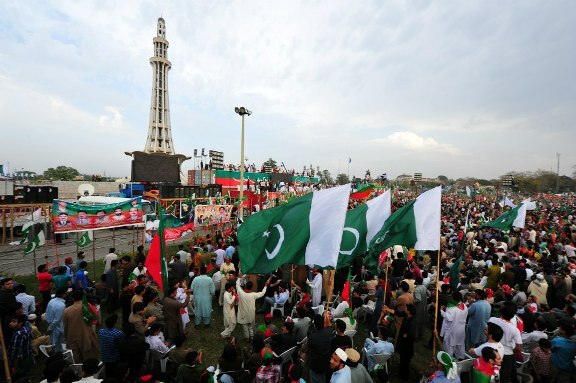 LAHORE: The district administration on Monday refused to grant permission to the Pakistan Tehreek-e-Insaf (PTI) for its public meeting at Minar-e-Pakistan on April 29. According to the letter issued by the Lahore deputy commissioner (DC), a copy of which is available with Pakistan Today, the Greater Iqbal Park, in which Minar-e-Pakistan is located, is a part of national heritage and the Cabinet Committee on Law and Order has already directed to put an end to all types of political and religious gatherings in a bid to ensure safety and security of the infrastructure there. The DC has also asked PTI Member Provincial Assembly (MPA) Shoaib Siddique to hold the public meeting at Nasir Bagh instead, which is a notified place for holding rallies and processions. While the fate of the rally at Minar-e-Pakistan hangs in the balance, it is worth mentioning that the PTI has decided to woo voters and celebrate permanent disqualification of former prime minister Nawaz Sharif through a musical concert and public rally on April 29. The party has invited popular singers including Abrarul Haq, Attaullah Isa Khelwi and the musical band Strings to perform during the rally that delegations from Peshawar, Karachi and Quetta will be attending. The apparent target of the power show is to target the voters of the Walled City of Lahore, which is considered to be the “fort” of the ruling Pakistan Muslim League-Nawaz (PML-N). A display of firework has also being planned to enthral party leaders and workers, while the responsibility of the mega event has been given to aspirants for provincial and national assembly tickets to prove their strength and show their fits. PTI Chairman Imran Khan will be reaching a week before the event to warm up the workers and leaders. Abdul Aleem Khan will be the head of the administrative committee, while PTI central leadership including Vice Chairman Shah Mehmood Qureshi, Asad Umar and Jehangir Khan Tareen will hold corner meetings ahead of the rally. Regardless of the refusal, PTI leaders headed by central Punjab President Abdul Aleem Khan on Monday visited Minar-e-Pakistan. They reviewed the stage and sitting arrangements and directed proper security there. Speaking to the media, Aleem said that the PTI was going to hold a mammoth public meeting on the same place where the Pakistan Resolution was passed and the arrangements for the event would be finalised soon after Imran Khan’s arrival in Lahore. He also said that Lahore would be decorated with party flags, hoardings and steamers of the PTI from April 21 while around a hundred camps would be established in different areas of the provincial capital. Meanwhile, Aleem Khan, Leader of Opposition in Punjab Assembly Mian Mahmoodur Rashid, Senator Chaudhry Muhammad Sarwar, Member National Assembly (MNA) Shafqat Mahmood, MPA Shoaib Siddiquee, Ejaz Chaudhary and PTI central Punjab Secretary General Shaukat Bhatti also held a special meeting to discuss the arrangements and strategies pertaining to the public meeting.